Happy Monday loves! I hope everyone had a fantastic St. Patrick's Day weekend! I had a blast out with my girl Kerri, as usual. But unfortunately my clumsy self didn't come out of the weekend totally unscathed. I ended up twisting my ankle pretty bad Saturday so as some of you already saw on my Snapchat/Instastories, I'm hobbling around on a swollen and bruised ankle. Luckily it's my left ankle so I'm still able to drive but it's definitely made life interesting! 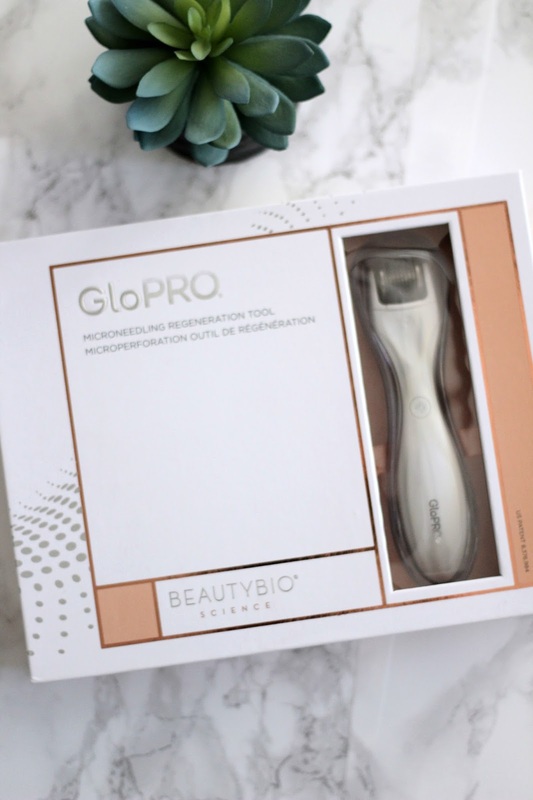 Ok enough talk about what a klutz I am, let's talk about my newest beauty obsession... microneedling. 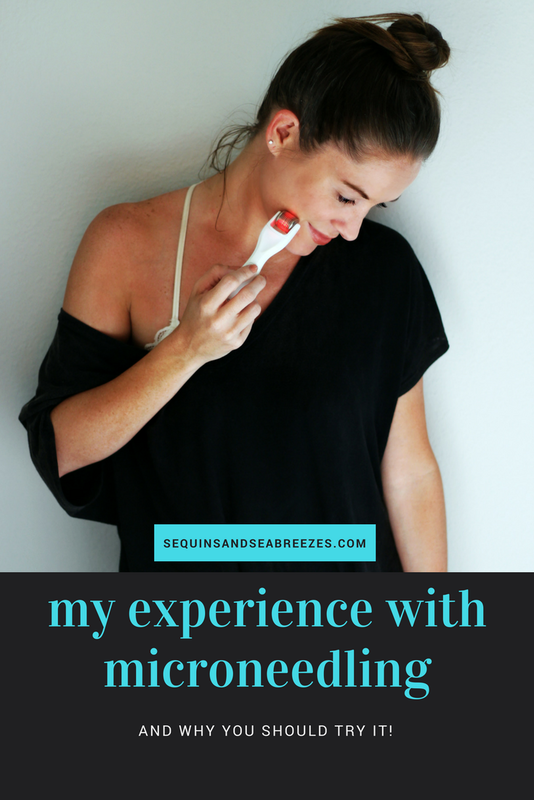 I'm not going to lie, when I first heard about microneedling I was a little hesitant. There's something about pricking your face with a bunch of tiny needles with a device that looks like it was used to torture someone that makes a girl a bit nervous but after reading a bunch of reviews I decided to give it a try. I spent a lot of time out in the sun without sunscreen when I was younger and I'm extremely expressive with my facial expressions so I was getting to the point where I was either going to bite the bullet and get Botox or figure something else out to help my skin so this was my last resort and I figured, what do I have to lose? Mircroneedling works from the inside out by triggering skin’s natural healing process and inducing micro-regeneration deep within the skin. By gently damaging the skin, you trigger its natural healing properties which causes the creation of collagen. This allows any serums or moisturizers to reach deeper levels in your skin and it helps your topical skin care products be absorbed by your skin 200 times more effectively. I use my GloPro 2-3 times a week for no more than 5 minutes at a time. I usually use it only at night since my skin is very sensitive and it tends to make my face a bit red plus I prefer to use it before my nighttime skincare regimen. I usually apply my RetrinAL cream immediately after and then top it with my hydrating night mask. I've only been using it for a little over a month but I've definitely been happy with the results. They say you should use it for 2-3 months before seeing significant results but I have been happier with my skin and I've definitely noticed smaller pores and a glow! If you're on the fence about getting a GloPRO, you can try out this one for less than $20! The needles are slightly shorter than the ones on the GloPRO and it doesn't include the LED light but it's definitely worth it if you want to try before taking the plunge on a GloPRO. I want To try this and am glad you shared your experience so far. Hope your ankle is better real soon! 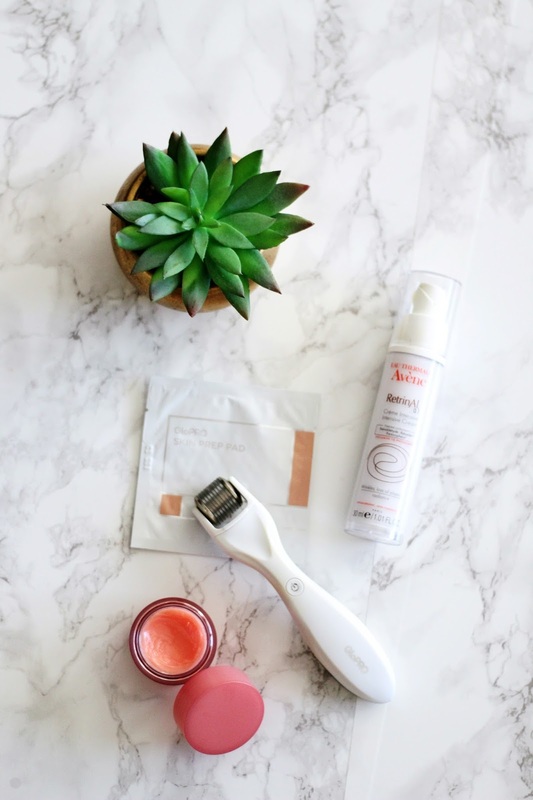 I feel like everyone I know is trying microneedling- and I think I need to check it out! Hope your ankle feels better soon! I have definitely been hesitant to jump on this skincare regimen but that's awesome you're seeing results! Might need to check it out!! Happy Monday! I have been wanting to try this for a long while now. Thanks for this review! So funny, I was planning on doing a post about this, too! I am loving it so far. And I use the same skincare product! I love both! oh this looks fun! you know i'll try ANYTHING when it comes to the skin. and that price point you can't beat it! anyway weekend was a blast - hope that ankle heals up asap! I really need to get on it with microneedling. I'm going to try the ine you recommended and if I'm not a total baby about it just go for the GloPro. Thanks for sharing this! I'm not familiar with this at all, but it sure sounds intriguing! My poor skin can use all the help it can get at all times, ha. Hope you're ankle is doing better today! I've been so intrigued by this one!! So glad to hear you like it... I may take the plunge soon! This is something that has been on my things to try...seems so interesting. I have one on my Amazon wishlist right now. Tomorrow is pay day so I'm thinking about getting it. Good to know that you've been noticing results already! I really do need to give this a try! So sorry to hear about your ankle - hope you're on the mend soon! I have been so curious about microneedling but also super scared I would cut my face! This is a great review and I love that you found one for under $20. A great way to try it out! But does it hurt?!? I'm also about ready to bite the bullet and get botox--my husband is horrified, but you gotta start that stuff when you're young! Hope you're ankle feels better soon! I have been so interested in this and been wanting to try it!